we had great time getting together with our families on saturday to celebrate my dad's birthday. 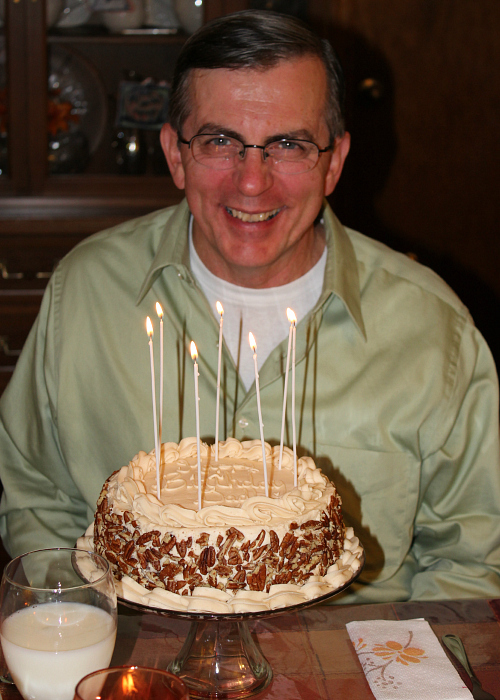 for dessert, ryan and i made a maple pecan birthday cake. since i was little, i have loved maple leaf candies, so i was excited to try this maple cake recipe. 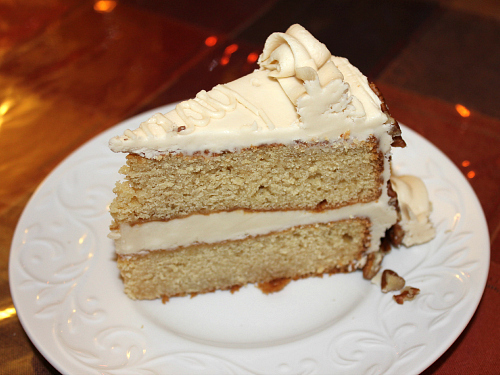 the cake consisted of two layers of maple cake with maple buttercream frosting between the layers as a filling. 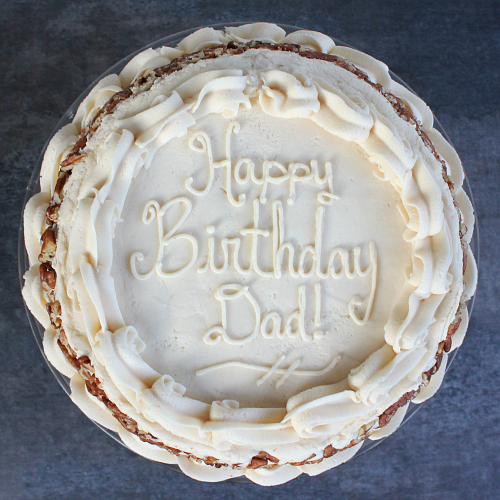 the whole cake was covered in a vanilla buttercream frosting and the sides of the cake were decorated with chopped pecans. the maple flavor in the cake itself was subtle, but it really stood out in the maple frosting. we opted not to cover the entire cake in maple frosting for fear that it would be too sickening sweet. the chopped pecans were a nice added touch that really helped to balance out the cake too. preheat your oven to 350 degrees F. to make the cake, combine the butter, sugars, and maple syrup in the bowl of an electric mixer. beat until light and fluffy (about 3-5 minutes). add the eggs, one at a time, beating well after each addition. stir in the vanilla. sift together the flour, baking powder, and baking soda. add the flour mixture in 3 batches, alternating with 2 batches of sour cream. beat just until combined. evenly divide the batter between two 9-inch round cake pans (be sure to butter and flour the sides of the cake pans and line the bottoms of the cake pans with parchment paper). bake for 35-40 minutes, or until a knife inserted into the center of the cakes comes out clean. once baked, allow the cakes to cool in the pans for 10-15 minutes before removing them from the pans and transferring them to a wire rack to finish cooling. to make the maple buttercream frosting, combine the butter, maple syrup, and half of the powdered sugar in the bowl of an electric stand mixer and whisk together until combined. gradually add the remaining powdered sugar. add more maple syrup or powered sugar to adjust the consistency of the frosting as needed. to make the vanilla buttercream frosting, combine the butter, milk, vanilla, and half of the powdered sugar in the bowl of an electric stand mixer and whisk together until combined. gradually add more powdered sugar until you reach your desired consistency. once the cakes have cooled completely, spread the filling between the two layers of cake. spread the frosting evenly over the entire cake. 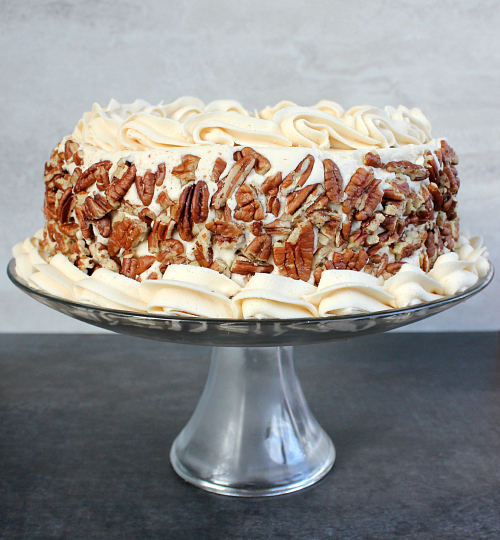 cover the sides of the cake with chopped pecans. The cake looks nice and tasted very good. A nice addition with the pecans. I liked the ivory color that the maple gave the cake.